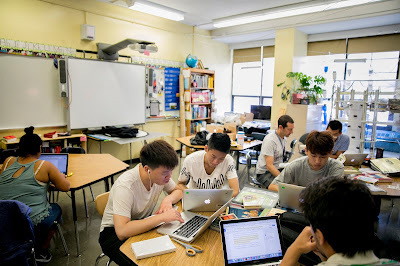 "Mastery-based learning allows students to learn at their own pace" reports Kyle Spencer, award-winning journalist and frequent New York Times contributor. Students at Flushing International High School in Queens working on projects during a summer program. For struggling students, there is ample time to practice until they get it. For those who grasp concepts quickly, there is the opportunity to swiftly move ahead. The strategy looks different from classroom to classroom, as does the material that students must master. But in general, students work at their own pace through worksheets, online lessons and in small group discussions with teachers. They get frequent updates on skills they have learned and those they need to acquire. Mastery-based learning, also known as proficiency-based or competency-based learning, is taking hold across the country. Vermont and Maine have passed laws requiring school districts to phase in the system. New Hampshire is adopting it, too, and piloting a statewide method of assessment that would replace most standardized tests. Ten school districts in Illinois, including Chicago’s, are testing the approach. In 2015, the Idaho State Legislature approved 19 incubator programs to explore the practice. More than 40 schools in New York City — home to the largest school district in the country, with 1.1 million students — have adopted the program. But what makes that unusual is that schools using the method are doing so voluntarily, as part of a grass-roots movement. In communities where the shift was mandated — high schools in and around Portland, Me., for example — the method faced considerable resistance from parents and teachers annoyed that the time-consuming, and sometimes confusing, change has come from top-tier school administrators. Some contend that giving students an unlimited amount of time to master every classroom lesson is unrealistic and inefficient. New York City Department of Education officials have taken a contrasting position. The city has a growing program called the Mastery Collaborative, which helps mastery-based schools share their methods around the city, even as they adopt different styles. To date, there are eight lab schools, whose practices are being tested, honed and highlighted for transitioning schools. M.S. 442 is one of them. Some struggling schools hope the shift will raise test scores. But the method is also growing in popularity among high-performing, progressive schools, as well as those catering to gifted and talented students and newly arriving immigrants. This fall, the Education Department plans to spread the method further, by inviting schools to see how the Mastery Collaborative works, even if they aren’t yet considering making the switch. They will be encouraged to attend workshops and tour schools, with the hope, one D.O.E. official said, that they will find elements that they can use in their own classrooms.